The steady as she goes condo market has started to wobble. Despite the noise in the detached market, the condo market has been churning out rather impressive price appreciation. Those days appear to be nearing an end. The average price per square foot, which has been an accurate gauge of condo prices in a sea of data confusion, officially peaked out in January 2018. Six months later prices have failed to push new highs, despite prices generally pushing new highs in the spring selling season. The average price per square foot now sits at $1034, a 5% increase year over year. While that’s still in positive growth territory, the deceleration of price growth has been noticeable in 2018. 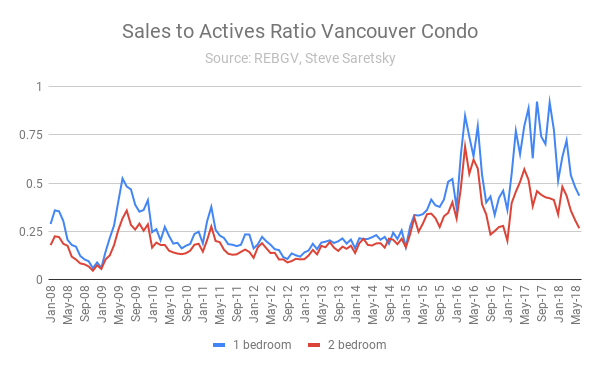 While condo prices have begun to stabilize, this is in large part due to a declining number of buyers. 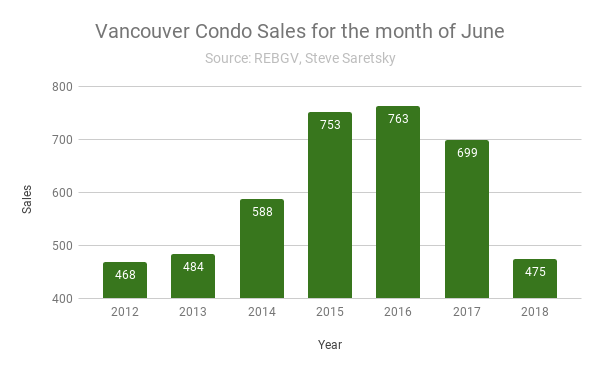 Who knows where they all went but Vancouver condo sales sank 32% year over year in June. There were a total of 475 condo sales this month, the lowest since June of 2012. As sales have begun to slide, inventory has finally stopped falling. After nearly three years of consistent declines in overall inventory, it pushed higher by jumping 40% on a year over year basis for the month of June. 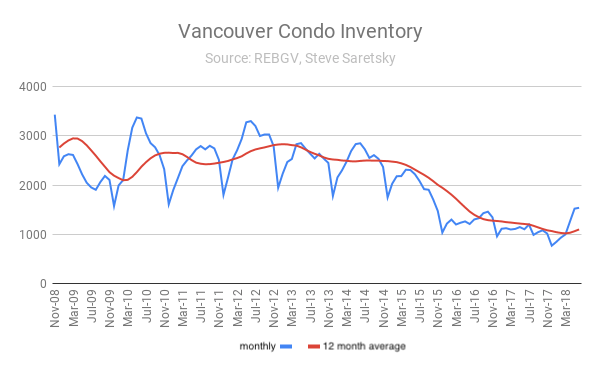 While that’s certainly an incredible jump it’s important to note inventory is still dwindling near all time lows, this will help cushion condo prices in the time being. Overall demand remains strong particularly in the one bedroom segment where the sales to actives ratio ticked in at 43%. That’s indicative of a sellers market and is holding up much better than two bedroom units which dipped down to 27%, the lowest mark for the month since June of 2014. 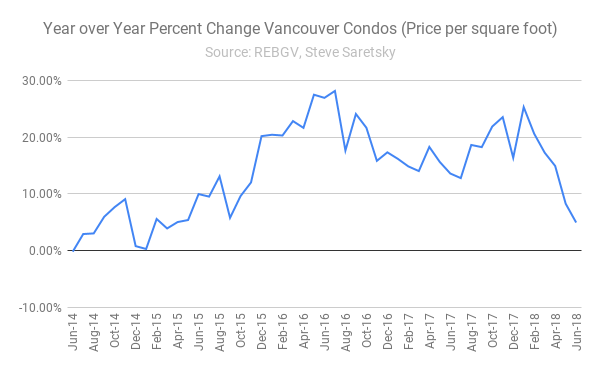 The number of Vancouver condos sold over the asking price also fell to 28%, down from 56% last year.